One of the interesting features of Twitter is that you can delete a “tweet” you’ve written and it will retroactively disappear from any of your followers’ lists of tweets. This is different from RSS, where, once an RSS reader has collected the post data from a feed, the excerpt (or entire post) in the RSS reader takes on a life of its own, independent of the original blog post. So if you make any revisions to your original post after various readers have been “pinged,” then chances are those changes will not be reflected in the RSS feeds. 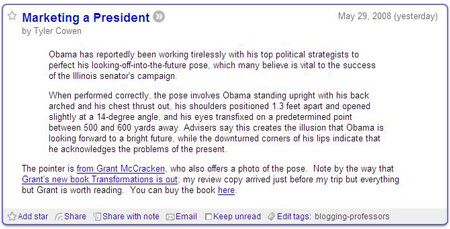 Case in point, Tyler Cowen at Marginal Revolution, posted a link to and some comments about a “news report” on how Barack Obama spends hours practicing gazing into the future pose. The only trouble was, this story, which Cowen appears to have taken at face value, was originally from The Onion. I read Tyler’s post on Google Reader, and when I tried to follow the story back to the Marginal Revolution site, I discovered Tyler had deleted the post, presumably because he realized his mistake. Here, below, is the only evidence that the post ever existed, a screen shot of the Marginal Revolution feed in my Google Reader. This vanishing post brings up some interesting questions for the age of blogging. When is it necessary to delete a post entirely, versus tacking on an addendum? Why not let an erroneous post stay live, but let the follow-up comments sort through any corrections that need to be made, preserving the original post as a kind of historical document (much as Wikipedia archives every version of a Wiki entry as part of the entry’s “history”)? Ignore the different looks this blog will be assuming these next couple days. I’m updating my templates and it’s going to take a while to get it all done. Damn Movable Type for totally changing the standards of their templates from version 2.6 to 3.x. It’s been such a hassle that I’m toying with the idea of switching over to WordPress–except that I can get my permalinks to work. That is, my old posts don’t export over with the same file names, so they’d be lost to Google and whoever else might have linked to them at some point (yeah, right). Where has Sample Reality gone? With a smile like that to look at, can you blame me for spending less time than usual online?